Well, that was about 12 hours ago. Now, I am not feeling Zen. My stomach is in knots and although this probably has something to do with the fact that I ate an entire box of Annie’s Whole Wheat Alfredo pasta last night, I think Date #7 is the real culprit. What if I don’t recognize him? Or what if I do and he looks nothing like how I’ve imagined him to look for the past ten months? What if we meet, only to discover that we can’t stand one another in person? Or, worse still, what if we can? What if we fall madly in love? What then? Fortunately I’ve chosen the perfect backdrop for our first date jitters to play out: the art museum. 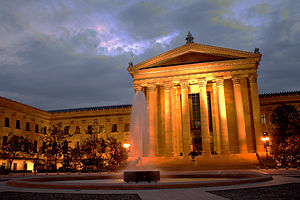 The Philadelphia Museum of Art is my go-to date for any potentially awkward social encounters. It’s one of the most gorgeous buildings in the city and in the event that Date #7 and I do fall madly in love, I’ll need to convince him to move to Philadelphia. The art museum offers one of the greatest views of the Ben Franklin Parkway and the Parkway is second only to Broad St. in its grandeur so obviously this is the best starting point from which to launch my campaign. On Friday nights, the art museum also offers two of my favorite things: wine and jazz. It’s hard to go wrong with Art After 5 (unless of course you’re there with a man who’s not your boyfriend while you’re actually dating someone else; then it’s very, very easy to go wrong… but that’s another story for another time). Last but not least, Date #7 likes art. Actually this is a bit of an understatement—he loves art, and I’ve taken enough art history courses in my time to offer up a few semi-intelligent comments on the contents of the main galleries. Even if we discover we have nothing to talk about, we can take a quick stroll through the Chagall exhibit, exchange a few words about Paris and go merrily (albeit rather disappointedly) on our ways. But I don’t think this is going to happen. In fact I’m pretty sure this isn’t going to happen. Now, before I sign off for today, a bit of housekeeping: I’m not sure that I’ll manage to keep up with my daily posting schedule over the weekend so if you don’t already subscribe to my blog, you should do so now (this way you’ll receive instant notification the minute I post my first report on Date #7). I will also be attempting Tweet any and all significant developments so follow me on Twitter for the real-time play-by-play. Exciting! Have a great weekend! And thank you and Date #7 for my vicarious evening. I will spend the real one driving various offspring to various events and attempting to stay focused on soon-to-be-overdue projects. so it all hangs on date 7. life changing then, what ever happens.